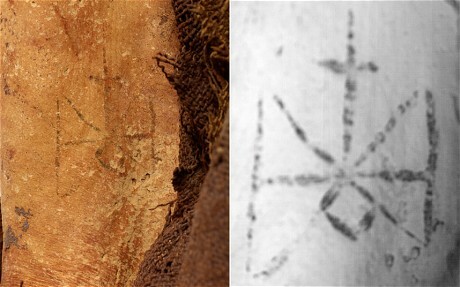 1300-Year-old Mummy Found Rocking Archangel Michael Tattoo | Be Kind. We're all in this together. A 1,300-year-old mummy found in Sudan was hiding an angelic intimate secret, which has now been revealed by CT scans done by researchers at the British Museum. The naturally-preserved remains of a Sudanese woman were excavated in 2005, but new investigations have revealed a tattoo located on her inner thigh which symbolizes the Archangel Michael. The tattoo itself is remarkable because it’s actually a monogram, which is the letters for the word ‘Michael’ in Greek compressed into a symbol. And I thought I was too old to be rocking my om tat. Silly me. This entry was posted in Uncategorized and tagged angel tattoo, Archangel Michael, mummy tattoo, NancyBragin. Bookmark the permalink.